Saturday, 26 August: Marty, Pete and I took a run through the Otways to Lavers Hill and then along the Great Ocean Road to Apollo Bay. We pulled in to the Gellibrand store for morning tea. As always, we received a friendly greeting from Maria and Peter even managed to find someone to talk ukulele playing with! From Gellibrand to Apollo Bay the road was wet in patches, but not at all slippery if you kept off the mossy bits. There was surprisingly little traffic going in our direction along the GOR and we made good time to Apollo Bay. After lunch at the Apollo Bay bakery we headed to Skenes Creek and the turned inland to Forrest. The road was quite wet and greasy most of the way. We also got a bit of light rain along this stretch. In these conditions the Spyder was in its element and Peter could have easily left the two big Kwakas for dead. From Forrest onwards it was dry and sunny. We stopped in at Phil R’s place at Deans Marsh for a cuppa and then headed home. 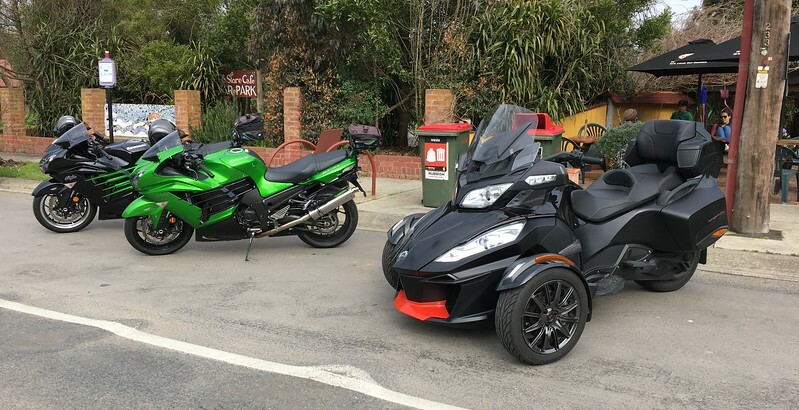 Despite the weather not being that great it was quite an enjoyable run and Peter showed that he has really mastered the Spyder – especially in tight, twisty conditions. As an aside, I blew a fuse in the power cable to the Venture heated jacket liner at the start of the ride. Fortunately I had a spare merino jumper in my bag, so didn’t get cold. However, it’s an important lesson and I will always make sure that I have an extra outer layer with me in cold conditions when I’m depending on heated gear, just in case it fails. 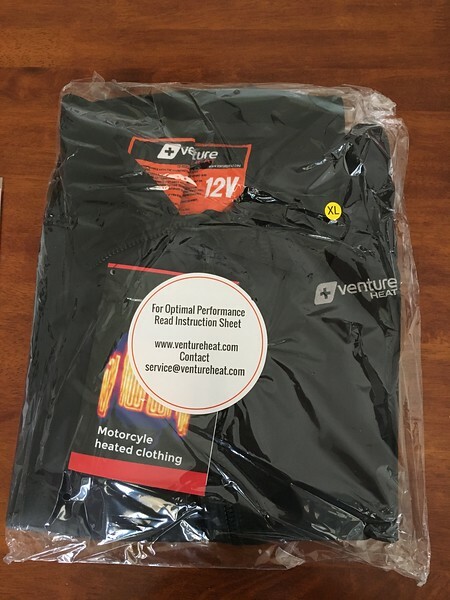 OK, back in early June I published my first impressions of the Venture Heat, heated jacket liner on my other website,( which sadly no longer exists) – see ‘First Impressions’ evaluation below. So two months later and quite a few cold day rides later, the honeymoon isn’t over – I really love this thing! Only time will tell how long it lasts, however, it appears to be damn near perfect at present! Today I took a 300km ride and again the jacket liner proved its worth. The forecast was for 16C and sunshine, so I wore my leather jacket rather than my textile / gortex lined jacket. Although the first part of the trip was sunny, it was still only 10C between Geelong and Gellibrand. 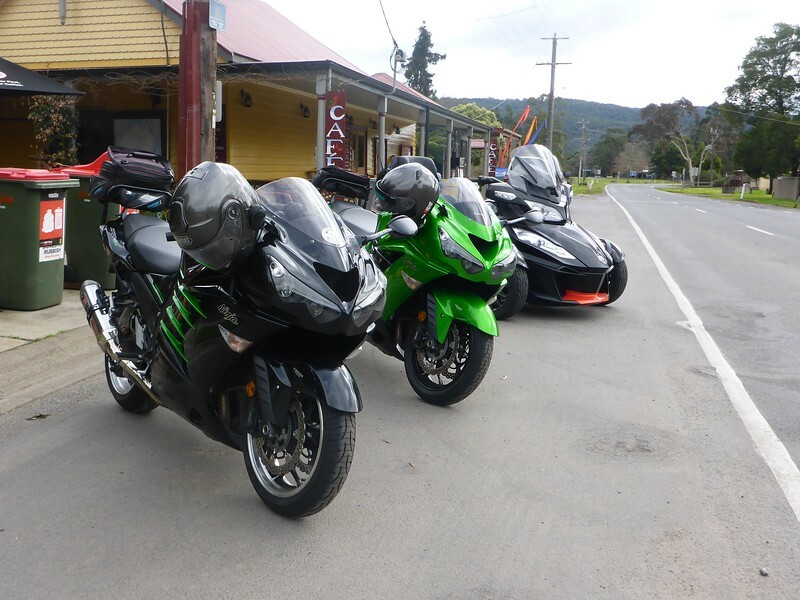 It then became cloudy and around 9C for the next leg of the journey through the Otways. With a thin merino T-shirt and a long sleeved cotton top under the leather jacket I would have been cold in these temps in the past, but add in the Venture jacket liner and I was able to adjust my temp up and down throughout the day, depending on the conditions. Most of the day it ran on ‘low’. Along with my heated grips, the Venture jacket liner ensured that I was toasty all day. And I don’t mean just the absence of cold as I get with my conventional kit – I mean toasty and warm on every leg of the journey. The moral of the story – I wasn’t caught out and cold by the weather being quite different from the forecast. There’s nothing quite as miserable as riding home from a ride, particularly with many kilometres to go, and being cold. Cold equals miserable in my experience of motorcycling! Don’t get me wrong, there have been massive improvements in motorcycle gear over the last 30 years, with merino wool garments, Gortex lined synthetic textile jackets and heated hand grips being right up there with the best things ever for winter riding comfort. My winter riding kit has just taken a massive leap forward with the addition of a Venture Heat, heated jacket liner from Zarkie Australia (www.zarkie.com.au). The power supply is super easy to fit with a connector to each side of the battery and with an inline fuse and then a plug to connect to the jacket. I deliberately dressed light for the first ride with the heated jacket and removed the inner liner from my winter jacket. The ambient temp was 2C so obviously I was going to be able to genuinely test how good the heated jacket would be. The Venture jacket is much thinner than the liner in my jacket. 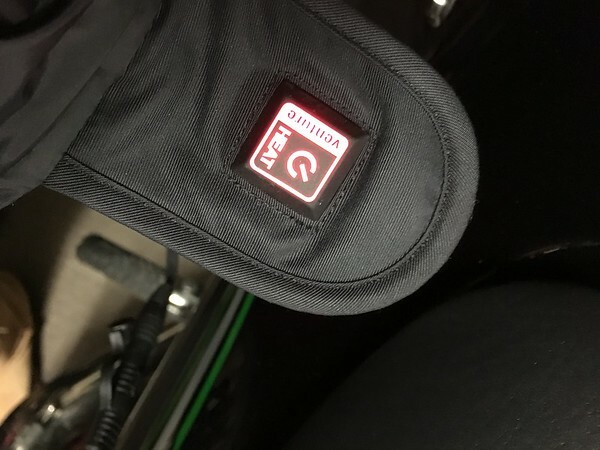 Rolling the ZX14R out of the garage, I started the motor, plugged in the connector on the Venture and held the soft switch for three seconds. By the time I’d put my helmet and gloves there was a really impressive amount of warmth radiating under my jacket. After 5 minutes on high (red glowing switch) the jacket automatically steps down to the medium setting (indicated by a yellow glow). I spent the next hour riding in 3C – 7C temps with my torso wonderfully warm (augmented by warm hands from my heated grips). 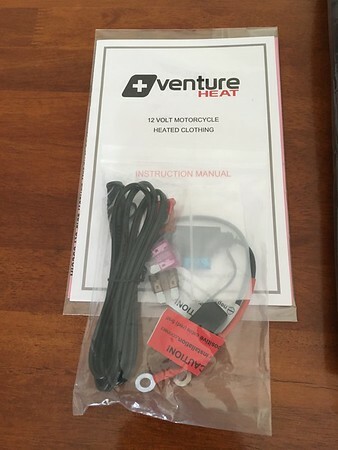 I believe that Venture also make heated gloves that plug straight into the jacket, however, I have no experience with them. Once it got above 10C later in the ride I turned it down to the low setting (green glow from switch). Other than the obvious thing of being beautifully warm, the jacket had two other advantages over my traditional multiple layers. The first being that with light clothing and the Venture under my jacket, I wasn’t all trussed up and had much more freedom of movement than I am with my multiple merino layers. The second unexpected bonus was that the warmth felt really great for my chronic back pain! The verdict on the Venture heated jacket? Based on my first shortish ride of around 200 kms I was very, very impressed. I will write further updates in the upcoming months as I use the Venture heated jacket in a diverse range of weather conditions. Now there is one caveat to all this review and that is that I was given the jacket by Zarkie to try out and review free of charge. All that was asked was that I write a review and link to their website. I was told that I can keep it, but let me say there was not even a subtle hint that I had to be positive about the product – just try it and write a review. So keep in mind before you spend your hard earned, that I did not!